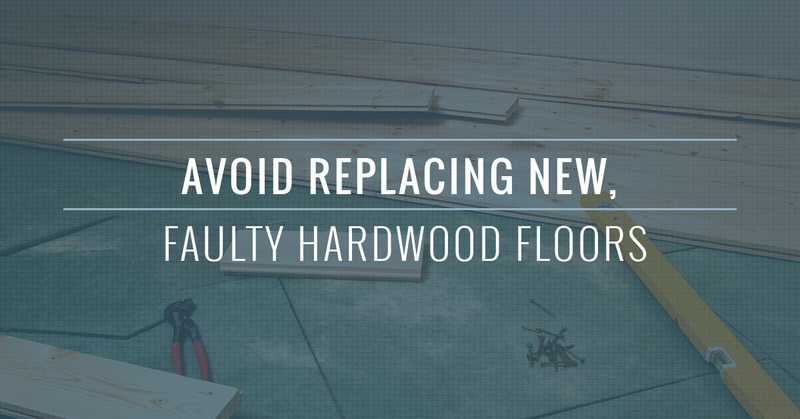 If, like so many homeowners, you’re considering hardwood flooring in your home, then you need to be very careful to avoid a very costly mistake that can lead to a re-do (often entirely at your expense) of your flooring. With an average cost ranging somewhere from around 10 to 20 dollars per square foot, the cost of hardwood floors are nothing to laugh at. Unfortunately, neither are the problems that are often associated with them. If you’re considering hardwood, be sure to avoid the common hardwood horrors, which may be more difficult than you think. When you buy hardwood flooring, you’ll often hear a lot of claims regarding durability, value, longevity, etc., but the truth is that these claims are often only relative to other types of hardwood, not all flooring. A common tactic salespeople use is to bang on a plank of the hardwood to show its durability, but that isn’t actually how hardwood is fragile in the first place; instead, a truly impressive display would be to show that it is water, scratch, and age resistant, which is obviously not possible. Even beyond flashy displays, your salesperson will likely show you to the product that “most people go for” or guide you to their company’s forum, which is full of approved posts and threads, to demonstrate how well-liked their products are. Just don’t be easily fooled, and always take 24 hours to thoroughly research what people have to say about a specific product, brand, thickness, and wood type before you commit to any flooring. Okay, here’s the deal: Most hardwood floors come from areas of the world that are not where you live. This means that the amount of humidity, sun exposure, and even temperature your wood floors will be subject to are likely going to be far different than what that wood is naturally able to handle throughout the year. These slight differences in wood acceptance can lead to big problems. Common complaints from exotic or mismatched wood types include the shrinking, bowing, buckling, bending, and even breaking of boards, any of which can take your floor from a level surface you love to a nightmare that you simply can’t afford to keep or replace. Manufacturers and installers alike will tell you to “acclimate” your floors by keeping the boxes stacked in your home for days, weeks, or months prior to your installation, but this method is only partially effective at best, which they likely won’t tell you upfront. In the worst hardwood horror stories, which are surprisingly common, every party leaves the homeowner hanging when things go wrong. The manufacturer can wash their hands of your claim, even if the product is to blame, by simply pointing out that you didn’t use their brand of glue to secure the floor (one of many cop outs they can use), the dealer will blame you for not using their installers or claim your installers didn’t correctly follow installation instructions, and your contractor or flooring installer will absolutely not cover any additional installations or material unless your contract with them covers product failure, which they almost never do. The long story made short is that you will almost always find yourself liable for something that isn’t your fault, unless buying hardwood floors counts. At Transworld Tile, you can have the best of both worlds: The beautiful wood look you want without the risks associated with wood. By going with a wood-look tile instead of genuine hardwood, you can maintain all the benefits wood floors have to offer without sacrificing the durability, longevity, and safety associated with floor tiles. We’re proud to have over 30 years of local service experience in the Simi Valley, Thousand Oaks, and San Fernando area that make us confident in our ability to find the floor tiles that will be best for your home.